This 25 to 30 year old C. japonica seedling of 'Betty Sheffield' first bloomed in 1982. 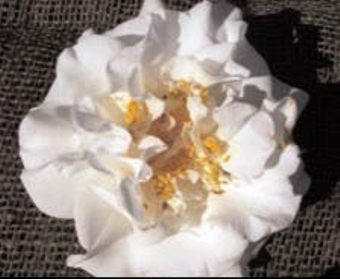 The 4.75" by 3" white peony-form bloom has 3 to 4 rows of large, broad, layered outer petals with many petaloids, bright yellow stamens and white filaments. Flowers have a slight fragrance, heavy petal texture. Won Best Seedling in the 1980s. Spreading and dense with average growth rate. Dark green leaves average 4 to 4.5" by 1.75".